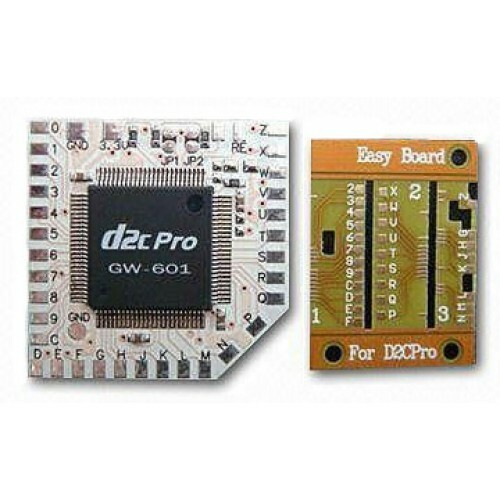 D2C Pro is a modchip for Nintendo Wii systems. It allows you to play back your backup copies and import games. After modification the Wii can boot these directly. The included Easy Board is used for easier installation. If you would like to buy a Wii system with a modchip pre-installed please contact us! Attention: Advanced soldering skills are necessary to install this modchip. With improper installation without the necessary skills the modchip or even your Wii system can be damaged. If you cannot do it by yourself we suggest you to get it modded by a skilled technician. Further we do not give warranty on any modchips since they can be damaged easily with improper handling.